Going to the supermarket may not be at the top of your ‘fun things to do’ list but it is a necessary chore. It is easy to get carried away and come to the end having spent a lot more than you ever intended. By having a plan, taking advantage of any offers and buying a brand lower than you normally would, you will be surprised how much money you can manage to save and still eat well. Most people make a vague list of what they want before they go to the supermarket but by making a comprehensive one and sticking to it, you will come away with only what you need. Organise your list by aisle so that you know what you need to pick up in each place. Then, avoid the aisles that don’t have anything on them that you need so that you can avoid unnecessary temptations. If you normally buy a named brand then go down to the supermarket’s own. If you usually buy the supermarket brand then drop down to the value level. You may think that you are sacrificing quality by doing this but the chances are that you probably won’t notice the difference. The most expensive items are out at eye level so make sure you take in all the shelves before making a choice. OK, this may be cheating but there are lots of advantages of shopping online. Firstly and most importantly, you are not tempted by any products that you don’t need and it is easy to stick to your list. Also, you don’t have the hassle of having to go round the supermarket with children or carry the shopping if you don’t have a car and you can do your shopping while watching the TV! Every week there are hundreds of offers as supermarkets try to compete with each other on price. Taking advantage of these offers is a good way to cut down your spending. However, be careful that you don’t buy things just for the sake of it and end up paying more. 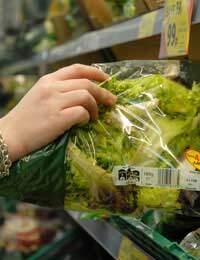 Most supermarkets will list their offers on their website or on an in store leaflet so you can plan before you go. Another offer to take advantage of are the points you can collect. This is basically free money and can be put towards your shopping bill in the future or saved up to use on other deals. There is not much chance that you will be able to avoid doing your food shopping but there are plenty of ways to make it cheaper and easier. Being strict with yourself is the best way to make sure you don’t spend too much. Make a list and stick to it as well as making the move down a brand. If you don’t like the new product then shift back up but it is unlikely you will notice on most things. Take the opportunity to do your shopping on line to help you with these aims and make sure that you take advantage of any points system that is on offer.